For trips to and from the office, or a day trip out of town, the insulated cooler bag that came with my pump works just fine. Generally, for longer trips, I will leave the ice pack that came with the cooler bag at home and, instead, fashion my own using a quart-sized, zip-top bag (I carry three or four in my pump bag at all times) filled with ice. On airplanes, the flight attendants are almost always happy to fill my bag with ice. I have only had one instance where I had to ask more than once. In terms of long-distance trips, I rely on my Yeti. Yeti makes the best coolers on the planet and they are beasts. I have two. My go-to is the Yeti Hopper. This is a soft-sided cooler that will keep its contents cold for days. It is built like a tank and can withstand baggage handling on multi-segment international flights. The best part of the Hopper is that it can be carried like a (very heavy) tote bag or attached to luggage with a strap. My suggestion is to chill the bag’s interior overnight before departure (fill it with bags of ice, zip it up, and let it sit overnight; replace with fresh ice before heading home) to help it stay colder longer. Yeti makes the Hopper in both 20- and 30-quart versions. I have the 30-quart one. 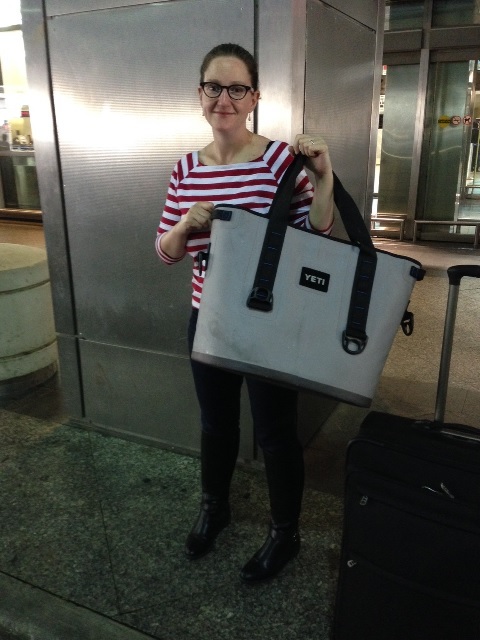 The Yeti and me headed to Australia, March 2015. 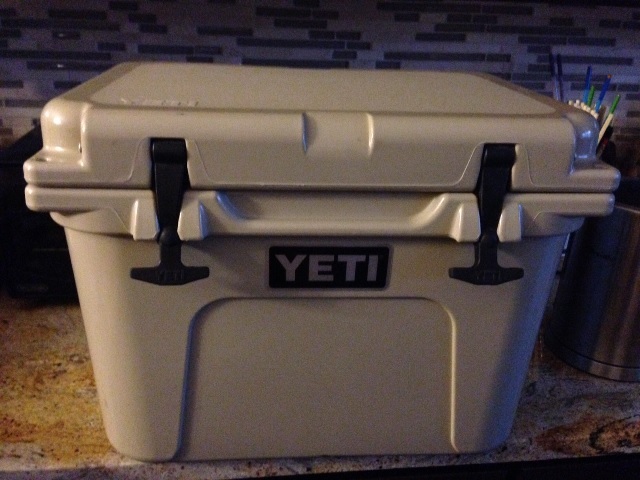 My back-up cooler is the Yeti Roadie 20. I bought the Roadie before Yeti came out with the Hopper. It is certified Grizzly Bear proof. Loaded up, it is impossible (for me) to carry without putting it on a luggage cart, attaching wheels, or balancing it on a larger piece of rolling luggage. That said, I got it from Switzerland back to the United States by myself fully loaded. It is doable, but you will need a workout program ahead of time. Luckily, I have a great coach who designed a plan for me and the Yeti. The Beast after returning from Switzerland, October 2014. With the coolers, I load up the individual milk bags in larger zip-top plastic bags to contain them and then nestle them between large zip-top bags of ice. When I am traveling domestically, I usually just fill the bags with ice from the machines in the hotel. These machines are rare overseas and I usually have to request ice from the hotel kitchen. The best experience I have had was in Sydney; when I called the front desk to inquire about getting some ice, they sent someone to my room to retrieve the bags and brought them back on a room service cart. Please refer to the section on safe handling for guidance around how long milk can be kept. In my experience, transporting liquid milk (i.e., not frozen) and frozen milk have worked equally well. On only one occasion have I had a concern about spoilage and needed to discard milk. In that case, it was with some liquid milk pumped on the plane at the start of a 10-day trip. Generally, I take the Yeti on all trips longer than overnight and I always check it. I have never had a problem checking the Yeti. I have gotten some interesting looks and comments, but I have never had an issue. Coming back home, I have never had a problem going through customs. I did once have an agent ask me how I liked the Yeti, and I, of course, provided a glowing review. 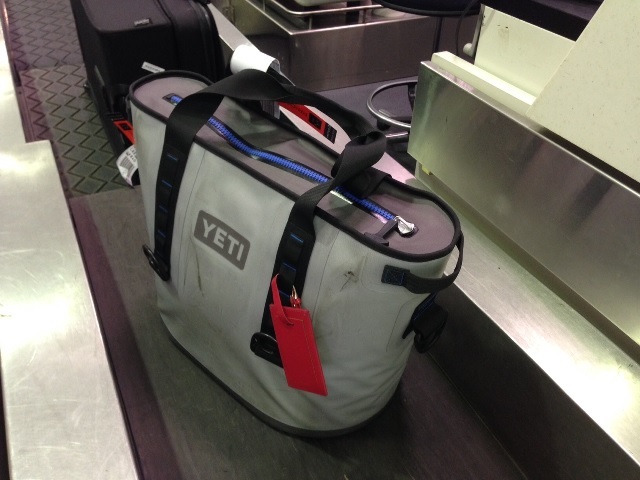 The other reason I take the Yeti and check my milk is to avoid having to take it through the security checkpoint. Although I make sure that the milk bags are secured in zip-top plastic bags before placing them in the Yeti, even on multi-segment flights, I have never had a bag rupture or leak. The Yeti is very protective. Plus, being in the belly of the aircraft, the Yeti is going to be exposed to much colder temperatures than it would be in the cabin. Checked in and ready to go home at Sydney Airport, March 2015. For those who travel infrequently and can’t justify the acquisition of a Yeti, there are other coolers that I’ve been told can do the job. Although I don’t have experience with them personally, one mom recommended the Polar Bear as a Yeti alternative. Carrying liquid breastmilk through an airport, even in the United States, can be challenging. You have to know your rights and the rules are subject to change. I have had difficulty going through Frankfurt Airport in Germany when I was changing planes after an overnight flight and the security personnel were puzzled as to why I had breastmilk and no baby. It took about 30 minutes of explanation and some fumbling with Google Translate, but I was able to explain (and keep the milk). The best advice is to travel with a print out of the breastmilk travel guidelines for the countries through which you are transiting. Typically, the most trouble I have in airports is with the ice needed to keep the milk cold. I’ve been questioned with both the Medela ice pack that came with my pump bag and my self-made, zip-top bag ice packs. The reason I like the DIY ice pack solution is that, if the security personnel are insistent that the ice be discarded, I can keep the zip-top bag and go refill it just beyond security. 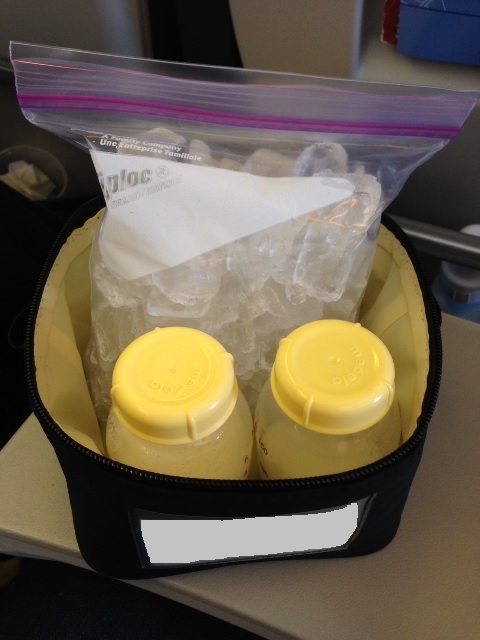 DIY icepack on a flight to Ontario, December 2014.